Chemically known as Trichloroacetic Acid, TCA Peels range from a light to deep strength peel, with the concentration potency of the acid being the determinant of subsequent strength efficacy. 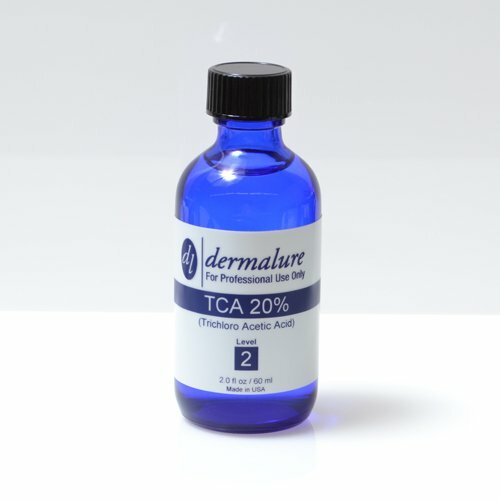 TCA can be used in a wide variety of ways depending on the concentration of the acid, making the benefits of this peel vast: glowing skin tone, softer texture, increased clarity, reduction of acne, clogged pores, wrinkles and fine lines; increased production of elastin and collagen; erosion of melasma, hyperpigmentation, freckles, scars, tattoos, and most blemishes of the skin. This peel is a medium strength peel. It revives the skin with radiance and glow at moderate downtime and peeling. It can be used to treat fine lines, wrinkles, uneven complexion, acute acne and mild acne. This peel is for experienced users and should only be administered by a professional only. At Dermalure, we want to help you get the smoothest skin possible. Our mission is to serve your skin through offering peels & serums that are both cutting-edge and unconventional. After just a few applications of our chemical peel or specially blended serum, you will see younger skin and a fresher face. Our products are made proudly in State Of The Art Laboratory in USA. We provide Medical Grade Products for Dermatologist & Estheticians and Skin Care Professional. Here at Dermalure, we offer the most advanced and sophisticated products in anti-aging and other skin care and repair products. Our chemical peels are designed to improve all skin types and skin conditions. Accompanying our superior products is our exceptional customer service and family values, like honesty and trust. Chemical peel products are a more aggressive form of over the counter products. Salicylic acid peels, lactic acid peels, VI peels and TCA peels are all chemical peel products that have proven more effective in counteracting the effects of aging and lack of skin care. The active ingredients in these products have proven to be more proactive in treating skin conditions by boosting natural levels of proteins and enhancing skin radiance. If you have any questions about this product by Dermalure, contact us by completing and submitting the form below. If you are looking for a specif part number, please include it with your message.